Congress takes the job to their home districts. It’s August! For many that means a long-awaited vacation. For members of Congress it’s when they return to their home districts for the August recess. Although they are not in session in Washington, DC, from July 31 through Labor Day, the term recess is a misnomer, which is why it is officially called the “at-home work period.” This is because your legislators are going to be criss-crossing the district and meeting with constituents. You should expect your lawmakers and their staff to be available to discuss issues that are important to you as a private practice physical therapist. 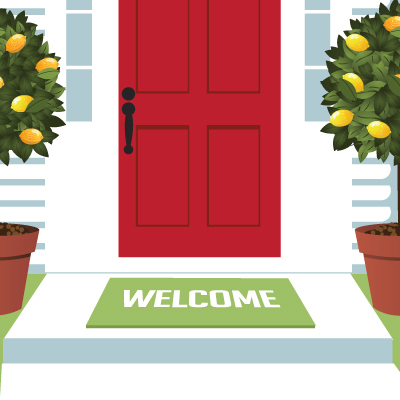 During the summer at-home work period, your representative and senators will be meeting with business leaders, advocates, supporters, and the general public. They will visit medical facilities and providers, small businesses, manufacturers, service organizations such as the Rotary Club, and other locations where they can meet community leaders and constituents who are eager to host them—even better if there is a good photo opportunity to share with the local press! Legislators often host town hall and round-table discussions, although because of the now commonplace raucous atmosphere at public meetings, some members of Congress are shying away from these forums. While 253 of you are Private Practice Section (PPS) Key Contacts, anyone can be part of the valuable grassroots effort to lobby on issues that impact your ability to provide quality care to patients in your community-based practices. This article lays out a framework for how to engage with your legislator and/or his or her staff. I will also provide talking points and tools that can be applied in any situation where you have the opportunity to discuss your role as a private practice physical therapist with someone who can affect policy change. This framework is flexible and can easily be modified for one-on-one or larger group meetings. The issues discussed with the member of Congress will be the same regardless of the setting—be it in his or her office, a town hall meeting, or even better if they come to your clinic for a tour and site visit. 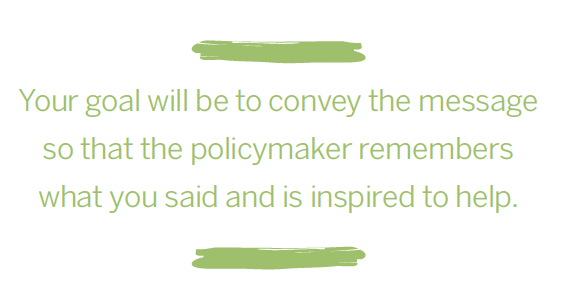 Your goal will be to convey the message so that the policymaker remembers what you said and is inspired to help. Some of you are represented by legislators who are traditionally supportive of the legislative and advocacy priorities of the PPS; others are not. In some cases, the issues you are advocating for have not yet come to the attention of your legislator. Regardless of how you anticipate your representative will respond, you must reach out and communicate your perspective and your needs in order for them to truly represent you. Legislators rarely cosponsor bills unless asked to do so. Your requests will be more impactful if you are able to share an example to illustrate how resolving the policy issue would improve conditions for their constituents. A visit to your clinic could be the best way for a member of Congress to understand not only your patient mix, but also the role you play in restoring physical function to members of your community. Reach out to your legislator’s local or district office, ask to speak to the scheduler; offer to give the member a tour of your clinic and an opportunity to learn firsthand the impact your practice has on the lives of your patients as well as the local economy. Schedules are often determined weeks in advance, so be flexible and provide the office with multiple options for dates and times. The typical visit will last between 30 and 60 minutes. If you have a patient who is a prime example of why the policy (e.g., the Medicare therapy cap) is harmful, consider including them. Once the visit is scheduled, the American Physical Therapy Association (APTA) can provide planning support. You can use the PPS website for issue summaries and one-pagers to give to your visitors. If you are comfortable with publicity, let them know that you are happy to have members of the press attend the tour as well. Savvy PPS members have parlayed local press coverage into exposure and business development, gaining new clients as a result. Through a site visit, you build your credibility as not only a skilled provider, but also an employer and local business leader. While it is not required, many legislators host public events in August. The two most efficient ways to learn of upcoming events in your area are to check your representative and senators’ websites for public events as well as to ask the district office to add you to the official event mailing list. Your elected officials may also have campaign websites where more political and perhaps even fundraising events are listed. A senator’s official website uses the following naming convention: www.senator’sname.senate.gov; for a representative it will be www.representative’sname.house.gov. If your legislator has the same last name as another member of Congress, use their first name too; for example, www.paulryan.house.gov is Speaker Paul Ryan’s official Congressional website. In most cases you can prepare for a meeting with your legislator; however, you never know where you could see them—at the grocery store, in line at a restaurant, or at a local park. In order to take full advantage of these chance meetings, be ready for a conversation by being familiar with the PPS legislative priorities. Please make a habit of logging in to the PPS website and checking out the Legislative and Advocacy tab. This page includes links to the one-pagers of each of the legislative issues that the PPS board has endorsed. You can use these handy summaries to become more familiar with the issues. You may also print them out and hand them to your legislator or their staff. When requesting a meeting as well as when you are face to face with the member or their staff, begin by identifying yourself, your patient mix (e.g., percent of Medicare patients), and the size (number of employees; number of patients seen daily or annually) and location of your practice—using landmarks to help the attendees visualize how you fit into the community. Be sure to emphasize the unique perspective of the private practice physical therapist who is not only a provider but also a small business owner and employer who has contact with hundreds of constituents each week. Briefly explain two or three legislative issues and share examples of how those issues impact your patients or your practice. If more than one physical therapist participates in the meeting, divvy up the responsibilities of presenting each issue—perhaps based on who has the best example to share for a given issue. If the staffer or member asks you a question you don’t know the answer to, that’s okay. Just say, “I don’t know” and tell them that the PPS lobbyists will follow up. As the meeting winds down, reiterate your request for them to cosponsor the bills discussed and hand them the one-pagers we have prepared for you. Before you leave, offer to be a resource and invite staff and the member of Congress to come to your clinic for a site visit. While PPS has a list of legislative and advocacy priorities that doesn’t mean that legislation has been introduced that would address each of the issues. The first half of 2017 has been busy with health care–related debate. While many issues have been discussed, a significant number of issues are still waiting in the wings at this time. As of this writing, four bills were introduced that the PPS Board of Directors has endorsed: the Medicare Access to Rehabilitation Services Act, which would repeal and replace the therapy cap; the Physical Therapist Workforce and Patient Access Act, which would add physical therapists to the National Health Service Corps; and two bills that seek to extend Medicare reimbursement to care provided via telehealth: the Medicare Telehealth Parity Act and the CONNECT for Health Act. When asked to make changes to current law, politicians respond better when they receive background information as well as explanations of how their constituents are impacted. For each bill discussed in the following text, go to ppsimpact.org for the online version of this article and click on the bill number to see whether or not your legislator has cosponsored the legislation. If your lawmaker has supported physical therapy issues in the past, please thank him or her for their efforts while also asking them to support the rest of PPS’s priorities. 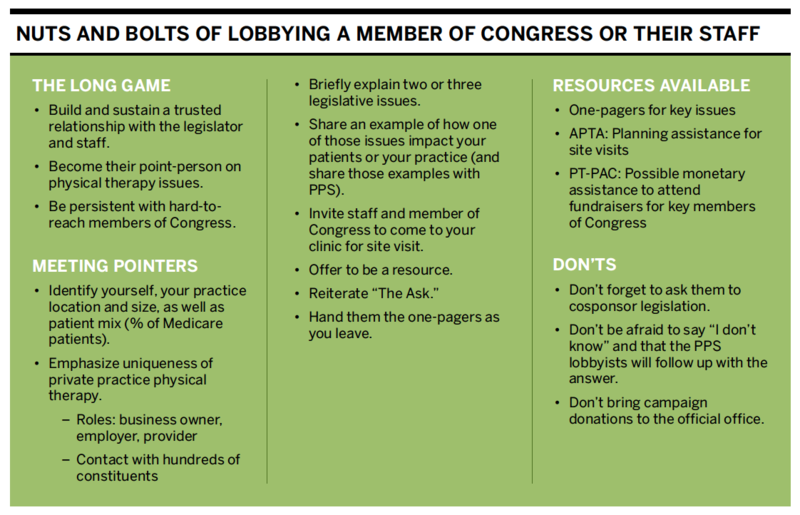 If your member of Congress has yet to support a given bill, you have an opportunity to lobby them on behalf of your patients, your business, and the profession. Here are some talking points to use when communicating with your elected officials. Private practice physical therapists ask for your support of bipartisan legislation that would permanently repeal and replace the $1,980 therapy cap imposed on physical therapy, occupational therapy, and speech-language pathology services. Doing so would ensure that those beneficiaries who are most in need of therapy are still able to receive the necessary services. Because the current exceptions mechanism expires on December 31, 2017, corrective legislation must be passed before the end of this year. This bill would add physical therapists to the existing National Health Service Corps (NHSC) Loan Repayment Program. Many physical therapists live in urban and suburban areas, creating a maldistribution of physical therapists throughout the country. The NHSC serves as a pipeline to bring providers to underserved areas, many of whom remain to practice in those communities. For example, in 2012, the NHSC had an 82 percent retention rate for providers within the program. Currently, there is no rehabilitative care component in the NHSC, and physical therapists are not eligible to participate in the program. PPS believes that providing access to therapy in rural and underserved areas will improve outcomes and reduce costs. Including physical therapists in the NHSC will improve access to rehabilitation services in underserved communities. PPS believes that providing access to therapy using telehealth will improve outcomes and reduce costs. Current statute limits telehealth coverage and reimbursement through originating site and geographic restrictions. Only Medicare-defined physicians and certain practitioners are currently permitted to be reimbursed for providing telehealth services; physical therapists are not eligible. The following two bills seek to modify current law to expand the list of providers and circumstances when care provided through telehealth would be reimbursed. This bill would enable Medicare to cover the use of telehealth for patient care in the same way that it pays for any other covered services. It does so by authorizing additional providers including physical therapists, occupational therapists, speech-language pathologists, audiologists, and licensed respiratory therapists to be reimbursed for telehealth. The legislation also expands access to telestroke services, regardless of where the patient is located. 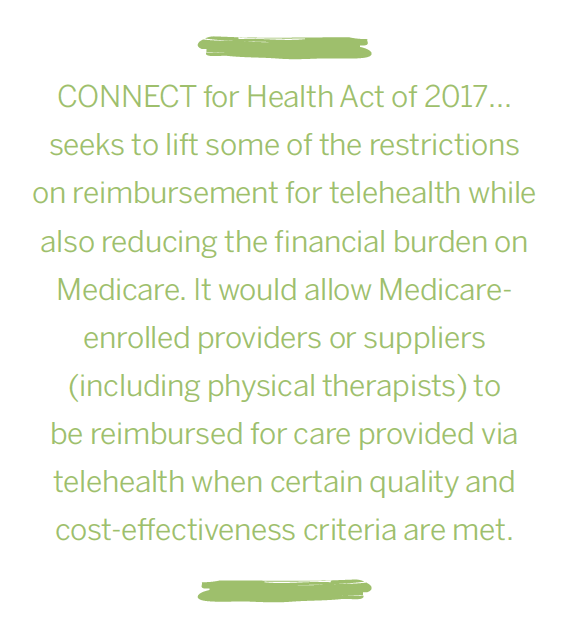 This bill seeks to lift some of the restrictions on reimbursement for telehealth while also reducing the financial burden on Medicare. It would allow Medicare-enrolled providers or suppliers (including physical therapists) to be reimbursed for care provided via telehealth when certain quality and cost-effectiveness criteria are met. The bill also lifts restrictions on the use of telehealth by those providers participating in Accountable Care Organizations, by those paid through global or bundled payment, and for care covered by Medicare Advantage plans. As in the Medicare Parity Act, the CONNECT bill allows telestroke evaluation and management sites to be covered as originating sites—regardless of geographic location. As PPS members and health care professionals, you are ideally positioned to advocate for the legislative priorities of the Section, while highlighting your role as a member of the small business community—whether you are an employer or an employee of your clinic. Legislators recognize that small businesses are the economic engine of the United States; most of them consider the burdens and benefits for small business when evaluating the impact of legislative proposals. Giving them and their staff a person and local business to reference when considering a bill can make a big difference. The more you educate your elected officials, the better equipped they are to represent you and respond to the needs of the profession and the patients you serve. The more PPS members reach out this month, the better positioned we will be to see progress on our legislative priorities when the members of Congress return to Washington, DC, after Labor Day. Alpha Lillstrom Cheng, JD, MA, is a registered federal lobbyist working with Connolly Strategies & Initiatives, which has been retained by PPS. An attorney by training, she provides guidance to companies, nonprofit organizations, and political campaigns. For six years, she served as Senior Policy Advisor and Counsel for Health, Judiciary, and Education issues for Senator Jon Tester (Montana), advising and contributing to the development of the Affordable Care Act, as well as working on issues of election law, privacy, government transparency, and accountability. Alpha has also directed Voter Protection efforts for Senators Bob Casey, Al Franken, Russ Feingold, and Mark Begich. She was Senator Franken’s Policy Director during his first campaign and was hand-picked to be the Recount Director for his eventual 312-vote win in 2009.